The Virginia Medical Reserve Corps (MRC) is a force of dedicated volunteers who stand ready to support the community in the event of a public health emergency. Each of the 27 local MRC units is comprised of teams of medical and public health professionals who, along with interested community members, volunteer their skills, expertise and time to support ongoing public health initiatives and assist during emergencies throughout Virginia. You Never Know When Your Community Might Need You. 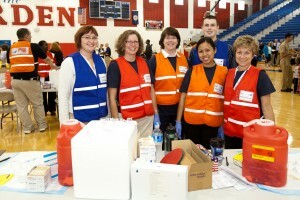 The success of our response to a large-scale public health event, such as a pandemic or bioterrorism attack, depends on how quickly and effectively we can mobilize MRC volunteers. 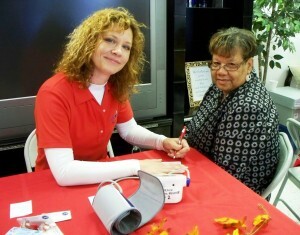 Health education and preventative health screenings. Efforts to provide medical services to at-risk populations. Volunteer emergency preparedness training and exercises. Local, state and national response to terrorism attacks and disasters; providing staffing support for medical services, emergency shelters, mental health outreach, dispensing sites for medications and vaccinations, disease investigations and environmental health efforts for food and human safety. To become a VA Medical Reserve Corps Volunteer, please submit an application in the Virginia Volunteer Health System.